Christmas and the meaning of human existence are locked in one and the same puzzle. Pelagia Bonniwell's raku people are gathered around an old shrunken lady. Her face speaks volumes of wisdom gleaned in years of wear and tear. She holds an oversized scroll of bright color which she is taking to the child in the manger. The scroll is tightly rolled and sealed. It represents the puzzles of human existence and its hidden meaning. There is always hope that the encounter with wisdom incarnate will unseal and decipher some of the puzzles. 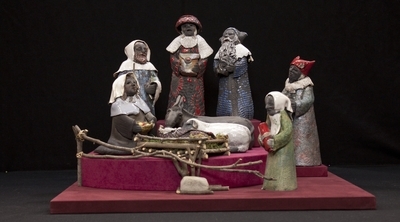 Glazed, terracotta figures created in 1996 by Pelagia Mae Bonniwell depicting the nativity of Jesus. Exhibition label originally written by Fr. Johann G. Roten, S.M. for exhibit entitled "At The Manger" and held at Roesch Library, University of Dayton.